We are about half-way through Matthew’s gospel. In this section of the gospel Jesus faces opposition. In this passage he seems to be looking back over his activities. He considers what he has achieved, successes and failures. He realises that his message has had practically no effect on the rich and the learned of Jewish society, while it has been accepted joyfully by a small group of his disciples who cone from the poor and lowly classes. Take time now to read Matt 11: 25 – 30. Although it is just six verses long you would be well advised to read it out loud, and several times. What is the significance of this phrase? Let us look at what has just preceded our reading. Verse 5 “Go tell John what you hear and see.” This is followed by a description of the kingdom. Verse 11 This speaks of entering the kingdom. Verse 17 Again we are invited to reflect on entering the kingdom. Both these incidents remind us to “choose life”. The verb “to know” in the Bible is not used to indicate that one has met with a person a few times or that we recognise somebody. It means to have a deep experience of that person, to have entered into a deep and intimate relationship with somebody. To help us understand this text better we will now divide it up. Give each part a title. This is how I understand it. Have you divided it differently? 25At that time, Jesus exclaimed, “I bless you, Father, Lord of heaven and earth, for hiding these things form the learned and the clever and revealing them to mere children. 26Yes, Father, for that is what it pleased you to do. 27Everything has been entrusted to me by the Father; and no one knows the Son except the Father, just as no one knows the Father except the Son. To gain a clearer understanding of the first part we will rewrite it. Note how the writer emphasizes what is important for us. 25At that time, Jesus exclaimed, “I bless you, Father, Lord of heaven and earth, for revealing them to mere children. 26Yes, Father, for that is what it pleased you to do. We again find repetition in the third part of the reading. Pray using the words of Scripture. Eight parts have been selected which you may use for praying in words of scripture. It is wise to only use one or two of these for each period of prayer. 25At that time, Jesus exclaimed, 1. “I bless you, Father, Lord of heaven and earth, for hiding these things form the learned and the clever and 2. revealing them to mere children. 26Yes, Father, for that is what it pleased you to do. 3.27Everything has been entrusted to me by the Father; and no one knows the Son except the Father, just as no one knows the Father except the Son. Enter into your using your imagination. 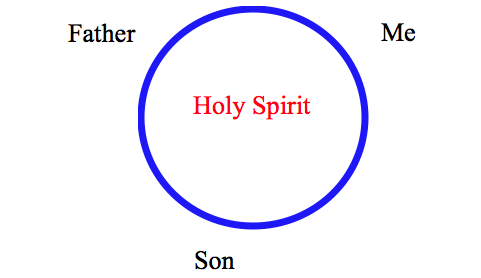 Imagine you are seated at a round table with Jesus, the Father and the Holy Spirit. You enter into a deep conversation with them. Each time respond using the selected words in the text. 1. This is a prayer of praise. Think of the many times that you have seen the Good News in action. Enter whole heartedly into this prayer of praise. 2. When were you aware of receiving a new insight, a new understanding of God? How open am I to growing in my understanding of God? What new insight have you received into your relationship with Jesus? 3. Bring to mind something that God has entrusted to you. 4. Do you really know Jesus? 5. What an extraordinary invitation this is! Everything costs. Jesus invites us to follow his teaching (yoke). He assures us tah there is a cost to living our lives by his standards, however this is a small price to pay. Paul tells us, “I want you to be happy.” Phil 4: 4 Everything Jesus asks of us in for our own good, to enable us to live life to the full – “have eternal life”.